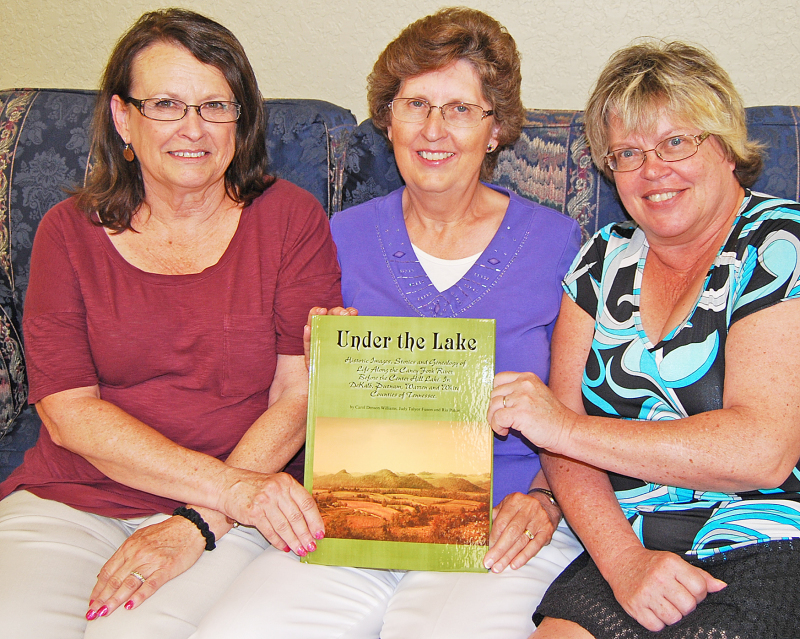 KEN BECK photo From left, Carol Denson Williams, Judy Taylor Fuson and Ria Baker hold a copy of their new book, "Under the Lake." Three DeKalb County women have spent the past four years resurrecting memories that were buried beneath the waters of Center Hill Lake seven decades ago. The result is "Under the Lake," a 304-page hardcover book that weighs four pounds and holds more than 1,000 photographs and 8,000 names. The subtitle of the monumental undertaking by Carol Denson Williams, Judy Taylor Fuson and Ria Baker is "Historic Images, Stories and Genealogy of Life Along the Caney Fork River, Tn. DeKalb, Putnam, Warren and White Counties of Tennessee." The first printing of 400 copies sold out in seven days. A second printing should be coming. Said Baker, "Carol says it took four years. I say 10. It got to be a chore before it was done. I had to keep reminding myself, 'Am I having fun yet?'" What inspired the three to tackle such a sublime project? "The lake is a large part of DeKalb County, and no one written anything about it," said Williams. "We knew the Army Corps of Engineers had taken the property, but what about all those families who lived there? Where did the come from and where did they go?" Center Hill Dam and Lake was authorized by the Flood Control Act of 1938 and the River and Harbor Act of 1946. Construction began on the dam in March 1942 but was delayed three years due to World War II. The 250-feet-high dam closed its gates on Nov. 27, 1948, and the rising waters of the Caney Fork swallowed 18,000 acres of land where farmhouses, barns, schoolhouses and church buildings once stood. Within a year, dozens of rural communities such as Cove Hollow, Indian Creek, Holmes Creek, Mine Lick, Second Creek and Falling Water were immersed. Today, the 64-mile-long Center Hill Lake boasts 415 miles of shoreline and is renowned for fishing and recreation. But that gives small comfort to those who saw their family roots engulfed by the waters nearly 70 years ago. "It's a hurt feeling. It's something you don't never forget," said Reba Taylor Nixon, 91, who lives in Watertown with her husband, Virgil. Mrs. Nixon was raised with six siblings on a farm on the lower end of Indian Creek where her father, Horace Taylor, raised tobacco, corn and vegetables and had a flourishing apple orchard. "We could walk to school and had a creek that run by it, and when the creek was up we walked across the swinging bridge. I can just see it now and would give anything if it were still there," she said, remembering places dear to her childhood--her home, Red Hill School and Indian Creek Baptist Church--that are now under water. Virgil Nixon's father, Ira, farmed corn and sugar cane on 68 acres of fertile soil where Indian Creek hit the Caney Fork. Gina Burton Dillon, who lives in the Tanglewood community of Smith County, is a descendant of two families that lost their home places when the lake was created. While she was not alive when Cove Hollow was flooded, her grandparents, Jessie Watson Burton and Hooper Burton, knew the loss most personally. The couple relocated to Lancaster. Dillon shared, "My grandmother said it was a terrible experience. They pretty much moved them off the land and didn't pay them very much. I think they were pretty devastated at the time to have to leave their property." Marian Starr Watson Driver, 86, of Watertown, was a sister to Dillon's grandmother. Driver was 15 when her parents, Alpha and Vinnie Watson, were forced to abandon their 300-acre farm on land about three-quarters of a mile above the dam. She recalled, "I am one of the last who lived in the Cove Hollow area. I think there are only three or four others. We lived in Wildcat Hollow next hill over. I was born in that house. I knew every rock about it and every cedar tree. I was all over that hill. My dad was born on that farm and his father before him. It was home to him. He knew every inch of land. "It grieved my father, but he also looked on the bright side. The river got up every year and the road washed away. We lived in a remote area without modern conveniences. I remember us getting ready to leave. 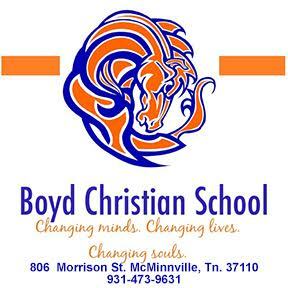 We left a month or two before we had to in order for me to go to school at Gordonsville. "We moved to Temperance Hall. Dad sold off all the cattle. He went to work at the dam, and two years later he bought a farm on Smith Fork Creek close to Lancaster." Driver went on to college and taught school for three years in the Smith County communities of Clubb Springs and Bowlings Branch. She then taught six years at Shop Springs and 22 years at Watertown Elementary. One of the hardest episodes for her parents was the day they watched the graves of their mothers, fathers, brothers, sisters, aunts and uncles in the Watson Cemetery being opened so that the remains could be transferred to Mount Holly Cemetery in Smithville. About 1,100 families were displaced by the creation of the lake. In the first years after the water topped the land, DeKalb County's population dropped by 4,000. Smithville's Mike Foster was born in 1947, a year before the Floating Mill area was deluged. It had been settled by his great-great-great grandfather John Puckett in 1802. "Where my great-granddaddy and Granddaddy Foster lived and where my daddy was born [between Interstate 40 and Hurricane Bridge on Highway 56 north of Smithville] is now covered with water, and when the lake is down a little bit, you can see the rocks that made the chimney and foundations of two houses where they lived. And you still see the graves where they took them out and buried them in Mount Holly. "It was a big life change to them when they moved out because they had lived there for several generations. I think they all regretted leaving there," said Foster. One of the first to snare a copy of "Under the Lake," Foster said, "The book is amazing. After I got it, I was looking at it until two o'clock in the morning. It is full of information about all those families who lived where the lake is now. I saw pictures of people I didn't know but then discovered they were some of my distant uncles." The trio of writers divided their labors with Fuson and Williams conducting the bulk of the interviews, while Baker created the maps, designed the book and shepherded it through the printing process. Williams said, "We took the names from each section of maps and put them in alphabetical order and started looking for families. DeKalb County historian Tommy Webb told us the names of the descendants of those who lost their farms who lived here, so that we could find them and talk to them." Webb also shared many vintage photos and copies of interviews that he had conducted in past decades with DeKalb natives. The authors dedicated the book in Webb's honor. For Fuson the project proved a trek into her family's past. Her father and grandfather farmed 158 acres on Indian Creek before they lost their land to the lake and relocated to Alexandria. Said Fuson, "When I was a girl, Daddy would take me fishing on the lake and would point and tell me, "This was our place.' I asked him, 'How can you know?' because it was under the lake." Her father, J.B. Taylor, known by most as "Mr. J.B.," was 29 when he left his home place. Now 99, he told his daughter, "My dad had been raised there and his ancestors before him. It was his home, and he hated to leave." Among the areas that Fuson researched was Indian Creek, which had been inhabited by many of her Taylor ancestors, the majority of whom were descendants of Bluetooth Taylor. "I was very glad that I was able to research the Taylor family and talk with my dad and get to know the different families of Taylors and how they are kin," she said. Williams said that her great-great-grandfather moved in 1835 on to land close to where the dam stands. At the time the property was part of Smith County. Her family surrendered their 180-acre farm with the birth of the lake. She lived in Smithville from age of 16 months to 7 years and then moved to Crossville. She returned to Smithville 20 years ago and taught special education at DeKalb County High for 15 years. Said Williams, "This has always been home to me. My mother died when I was 14. I didn't get to hear her stories. I wanted to learn more about the county and the adventures that happened on the river--the stories that my mother couldn't tell me." After digging into DeKalb of yesteryear, she has begun collecting pottery that was made along the Caney Fork River in the 1800s. Baker, a lifelong Alexandria resident, said many of the families they talked with described losing their homes and farms as "a horrible experience." "One man told his daughter that he'd rather die than give up the land that had been theirs for generations," said Baker. "One lady had a family who had a farm right on the river. I asked her if they had pictures, and she said they loaded up the wagon and took what they could, but they didn't take any of their pictures or furniture. She said her dad was broken-hearted and so hated leaving that he didn't want anything to remind him of it. There was nobody who wanted to go." Besides constructing the dam, another major undertaking by the Army Corps of Engineers was the task of removing the remains of 5,200 bodies from 82 family cemeteries and having them reinterred at Mount Holly Cemetery, which they specifically created specifically for this purpose. When quizzed as to what lies beneath the lake, Williams responded, "Memories and broken dreams. Lost communities. Families moved away to different areas and other states. Most of the churches never assembled again. It was a time and place that will never come back." Great article, Ken! Thanks to these ladies for their time given to produce this book! !